“Top 5 Wednesday” is a weekly meme currently hosted on Goodreads by Sam of Thoughts on Tomes in which you list your top 5 for the week’s chosen topic. This week’s topic is “favourite monsters/mythological creatures” and I found myself struggling. Not because I couldn’t find any favourites, but because there are way too many of them out there. Stick a pin in any random spot in any random country and chances are they’ll have some mythological creature that’s unique to the region. So I decided to get a little more specific and feature some monsters that are native to Korea and Canada (because–*waves*–Korean-Canadian here). And by “Canada” I mean its various First Nations tribes. Rooted in Algonquian mythology, Wendigos (or Windigos) are said to roam the forests of Canada and parts of northern U.S. either as a spirit or a physical monster (accounts seem to vary). Physically, it’s been described a rotting, emancipated werewolf-esque creature with preternatural speed and senses. Reeking of death and decay, the Wendigo is built to stalk and hunt humans. Its hunger is insatiable and no matter how much it feeds it remains in a state of perpetual starvation. As a spirit, it can possess people and render them to a state of mindless hunger. Greedy people and people who have practiced cannibalism seem to be its most susceptible victims. This book remains my favourite Wendigo story to date. With trademark lyricism, Yancey captures the visceral horror of Wendigos and the isolation of the Canadian wilderness so well. Inmyeonjo (인면조) is, simply put, a long-necked bird with the face of a human. And I absolutely hated the thing when I was a kid. The paleness of it combined with the period headdress made for some jarring nightmare fuel. But despite the sheer weirdness of its appearance, it’s a relatively benign creature, one whose existence is meant to bridge the sky with the land. 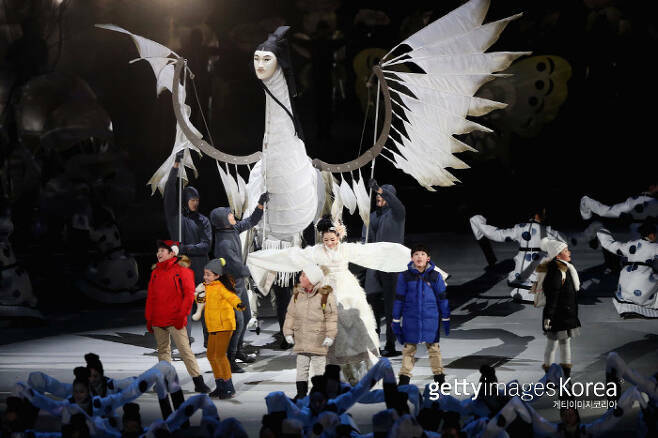 After all, the South Korean Olympic committee included it in the PyeongChang opening ceremony as a symbol of peace and harmony. All you K-drama fans will be familiar with the kumiho/gumiho from the 2010 series My Girlfriend is a Nine-Tailed Fox. Kumiho, which translates literally to “nine-tailed fox,” is an ancient fox spirit that can shapeshift into human form–most often a beautiful, seductive young woman. Much of East Asian folklore (and culture as a whole) is tightly intertwined, with big sibling China being the main influencer, so kumiho has its counterparts in kitsune (Japan) and huli jing (China). The most notable difference is that kumihos carry a marble (size of a candy) containing the entirety of the foxes’ strength and knowledge. And a human can gain all that knowledge by swallowing the marble whole. The other distinction is that while kitsune and hli jing are portrayed as mostly chaotic-neutral spirits–with tricks being the extent of their malevolence–kumihos are said to have a taste for human flesh. Male human flesh, in particular. With hearts and livers being their preferred delicacy. In some tales, the kumiho is able to shed its monstrous form and become fully human if it can resist the lure of flesh for 1000 days. This last bit I find fascinating because it really underscores the influence of Buddhism–the idea that our goal in life is to reach a higher state of being. A gorgeous comic set in 1968 Seoul. There are only 4 chapters out right now and it’s currently on hiatus, but it’s so worth taking a look. I need to set an altar to Yoon Ha because he’s writing all the Korean speculative fic I need in my life. There’s currently a surge of mainstream Asian SFF (especially in YA), but Korean speculative stories remain curiously absent. At this point I’m tempted to just write one myself. Originating from Inuit lore, Qalupalik is described as a humanoid sea creature that steals away disobedient children who stray a little to the water’s edge. The interesting thing is that she doesn’t eat the children she captures but hides them away in her secret lair. Which seems…oddly anticlimactic and begs the question of what the heck happens to the kids afterward (do they drown and get arranged in the qaluplaik’s underwater cave like dolls?) but hey, it’s a story meant to keep children from misbehaving, not the The Silmarillion. Munsch is a national treasure and I’m pretty sure this book is where I first heard of the Qalupalik. These guys are present in pretty much every Korean folktale. Dokkaebi are powerful horned goblins who carry around spiked clubs and other such magical objects. Unlike the ambivalence of Inmyeonjo and the violence of kumiho, dokkaebi are mostly just…goofy (in their action, at least. Their traditional appearance is red and hulking and rather quite scary). They seem to enjoy messing with humans as much as they like helping them, and they’re known to challenge hapless travelers to wrestling matches. I’ve yet to encounter them in western literature, but a google image search for “dokkaebi” gave me a wall of Rainbox Six Siege results, which is how I learned that they have a new playable Korean character whose nickname is “Dokkaebi.” So that’s pretty neat! Have you ever encountered these in any media? And what are some of your favourite mythical creatures from your country? The Iron Druid series is really good – as well as being great fun. Love this list! The book recommendations are really cool. I’ve heard of the game but don’t know much more than that. But that sounds super cool!! I think Until Dawn was the only recent game I played that had an Wendigo. Oh i need to check that one out! This is such a neat list! Oh, I loved this, Kathy! Some of the Korean mythical creatures are absolutely beautiful, and I loved learning about these and the First Nations’ creatures. I’d only heard of the Windigo before. I have not heard of any of these except the Wendigo. Clearly I need to be reading more folklore, these are so cool! I love how different countries have similar versions of the same monsters. It’s definitely fascinating how ubiquitous some of these creatures are. It’s kind of like how in nearly mythology there’s a story about someone descending to the underworld to rescue a loved one. Very cool list! I’m only familiar with the Wendigo (from Marvel comics) and the Nine taled fox which was in some older short story. Wendigo seems to be the one most people are familiar with! This is fascinating list. I’ve never heard of any these. I think it’s time to diversify my reading! Some of these *are* rather obscure–internationally, at least. 😀 Would love to see more lesser-known creatures in books! Oh, I’ll be looking forward to reading your Brazil myth post! I was kind of worried the list would be too obscure but I’m glad you found it interesting. 😀 And Shadow of the Fox is one I definitely need to read! I used to watch a lot of dramas with my mom, but ever since I moved out I haven’t been keeping track of any of the hot new shows. And My Girlfriend is a Nine-Tailed Fox wasn’t really to my taste either! The only one I have heard of from your list is the Wendigo and that is because there was at least one Supernatural episode where they hunt them. I don’t really know which mythical creatures are from the US and which ones we adopted from other cultures but I love dragons ❤ Especially the ones that coexist with humans and aren't just mindless beasts! I sort of remember that first Wendigo episode but I didn’t know they appeared in the later seasons too. And I’m totally with you on the dragons!! I like stories where they have their own society and government and whatnot. Kind of like Seraphina! I only watched like…2 seasons of Supernatural, but I’m guessing wendigos appear often in the show? What a fantastic post. I don’t want to give away spoilers but Seanan McGuire’s Boneyard or Alma Katsu’s Hunger could fit in with one of these. KUMIHO – I suppose this is similar to Kitsune? In which case Generation V by ML Brennan is a great example – and Seanan McGuire’s Toby Daye series also has a Kitsune – but I can’t say more about that! Ooh interesting! I’ve seen Boneyard around but I had no idea what to think of the cover–it’s got a lot going on. 😀 And Generation V sounds amazing and really different from any other vampire books I’ve seen lately. Definitely going in my TBR! This is such a cool list, Kathy! I love it 💕 I hope someone (you?) writes some SFF about Kumihos, cause they’re my new favorite mythological creatures! I’ve read Ninefox Gambit, but I didn’t know they mythology behind the ninefox thing. The first time I heard about a Wendigo was on Charmed. It was on season 1, so the special effects were a mess and it was far from scary. It sounds really creepy now though! My favorite mythological creatures from Norway are Huldra, a beautiful woman with a cow’s tale who lives underground in the woods and enchants men, and Nøkken, a shape-shifting water spirit who lures people so they drown. Cause of course a beautiful and powerful mythological female would take an interest in mediocre human men. Makes sense. That sounds wonderful! But the wait sure doesn’t. I’m loving your choices Kathy! I also chose the Wendigo because I think there’s something so creepy and fascinating about them. I haven’t heard of the others but they are wonderful editions and I’m loving that so many people are sharing creatures of their heritage and culture. I’m like a kid in a sweetshop with all this knowledge. *wonderful additions* not editions. Doh! Great article, I loved reading about creature and mythological creatures. I only heard about Wendingos, but the rest seem interesting, too, especially the Korean creatures. Do you have any book recommendations on Asian mythology (easier to read, not academical ones)? I would love to read more about it! Thanks! How interesting!! I’m Canadian and had only heard of the Wendigo, so it was so fascinating to read of the others. I had also heard of the Kumiho and Dokkaebi, but not of the others. Thank you for sharing this cool list!